Speaking at our Autumn Lunch, Adam Phillips provided a taster of the results of the online survey of members conducted in August. Adam began by thanking Sue Nosworthy for managing the exercise, Raz Kahn and Cobalt Sky for very generously providing the fieldwork and analysis for free, and the membership for the stunning response rate of 72% – not something achieved by any surveys of the general population nowadays. The survey was conducted online, unlike in 2012 when we used telephone, as almost everyone is now able to be contacted by email. The majority of our members live in London and the South East (4 in 5), two thirds are retired and a third are female. Almost half joined the Network in the last 5 years (46%). 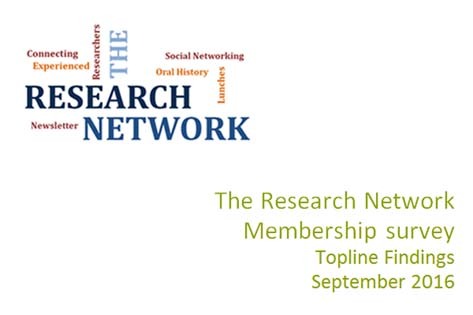 The overwhelming reason to join the Research Network, mentioned by 8 out of 10 respondents, was to stay in touch with friends and colleagues. Although events were an important part of keeping in touch, both regular news of members and the Newsletter were considered more important than events overall, presumably because they are accessible to all members. In terms of events, those we currently run are highly regarded and in line with expectations in terms of frequency and price. Suggestions for improvements revolve around inviting relevant speakers to events and providing increased opportunities for networking. There is sufficient interest in evening meetings, particularly among those under 70 and still working, to suggest that we will attempt to organise one as a trial. There will be more on these developments at the Christmas Drinks.